The Addams Family is a looking glass put up in front of your typical suburban nuclear family. Dad (Gomez), mom (Morticia), a pair of kids (Wednesday and Pugsley), complete with grandma, dear Uncle Fester, and lumbering butler, Lurch. They’re probably a lot like you and your family — except that their interests and likes tend to lean towards the macabre and ghastly, which to them are normal as day. Normal, in fact, to the point of not seeing how anybody would think them odd at all. Here in this musical adaptation of the widely loved family’s antics, that question of what is normal is brought to the fore. Wednesday Addams is all grown up and in love — with a plain as the plains young man from (gasp) Ohio. The very different Addamses and Beinekes are set to meet for the first time at an upcoming dinner party and Wednesday desperately wants to see them hit it off before she announces her pending engagement. She enlists her father’s help to smooth things along, inadvertently pitting him against her mother who she doesn’t want in on the secret. Meanwhile Pugsley is worried that his sister’s marriage will interfere with their regular torture sessions and Fester has fallen in love with the moon. Orpheus’s presentation of The Addams Family brings all the creepy, cooky, and seriously spooky fun that any fan would want to see from the beloved Addamses. 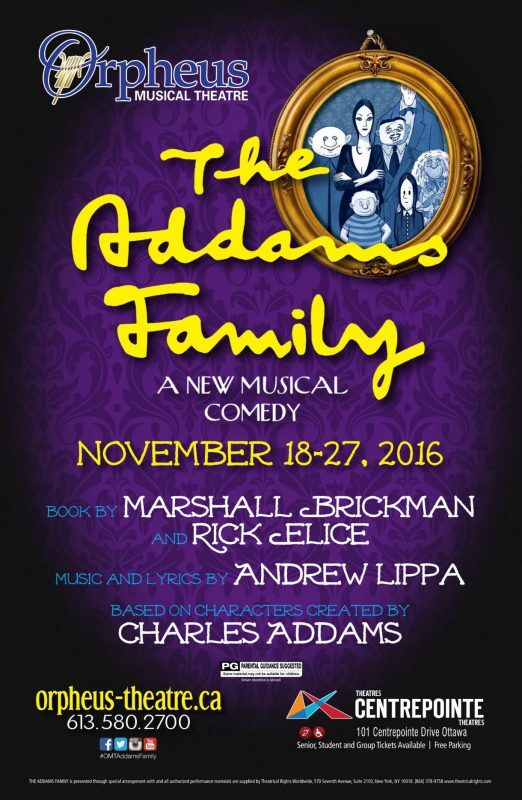 The show has a lot of good laughs, revelling in typical Addams Family humour of the macabre. The show was well-cast, with particular nods to Thomas Franzky’s latin dynamo, Gomez, Stefania Wheelhouse’s stone-cold Morticia, and Samantha Clarke’s vacant, emotionless, Wednesday. While suffering a few low points in the second act (Crazier Than You, in particular, left me pretty dry), the cast entire looks and sounds fabulous. No corners were cut in the show’s design as Orpheus brings its usual top-notch production value to the Centrepointe mainstage, with wonderfully on point costumes, cool make-up, fantastic sets, and brilliantly silly bits of staging. If you’ve never been a fan of The Addams Family, you can probably sit this one out, but if you are a fan, or you’re willing to indulge in some silliness and humour of the macabre, you’ll do yourself well to brave the November cold and pay the Addamses a visit. But that’s just my opinion and I’d love to know what you think. Does the Addams Family musical successfully translate their usual dark charm to the stage? Did you go gaga over Fester’s love affair? Join the discussion and let me know in the comments below.